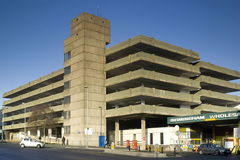 A man is fighting for life after falling from the upper-floor of a multi-storey car park in Birmingham today (July 4). The casualty, aged in his 50s, suffered life threatening injuries after he fell from a car park in Pershore Street shortly before 4.40pm, police said. He landed on the grounds of the wholesale markets depot in Upper Dean Street in front of horrified shoppers and traders. An eye witness, who was walking along Upper Dean Street when the man fell, said market traders ran to his aid and attempted to revive him. Police officers and medically-trained fire crews also tried to help the man before paramedics arrived. "Firearms officers, who were in the area at the time and have advanced first aid skills for major trauma incidents, arrived at the scene and started CPR until ambulance staff arrived. "The identity of the man, believed to be in his 50s, is not known at this time. CCTV cameras which may have captured the fall on camera.